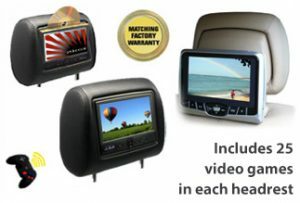 Keep your rear seat passengers entertained with their favourite movies, videos and games by installing an in-car multimedia system, specifically tailored to your vehicle. There are lots of options available, whether you want screens built in to your headrests an overhead screen, or replacement headrests with in-built screens. Let us design you a system that will keep all your passengers happy!! In Car Technology have installed many systems to the highest standard for local dealerships such as BMW amongst others. We only supply and install good quality products such as, Alpine, Rosen and Veba. All work is carried out by fully qualified engineers. The headrests will be trimmed by a professional trimmer and all the cables will be installed inside the headrest supports for a professional finish.